Leak Park spans 1.97 acres. It was gifted to the Urbana Park District in 1909. Now the site of the administrative offices of the Urbana Park District, Leal Park was once Urbana's first cemetery, containing the remains of early pioneers and Indians. Located along west University Avenue near Race Street, the cemetery was established along the Boneyard Creek at the north edge of the original 1833 plat of Urbana. Matthew Busey purchased a larger tract of land from the U.S. government in 1831, which included this area. He left the property to his son, Simeon, in 1854, who, in turn, transferred it to his brother, Col. Samuel Busey, in 1867.
founding of Urbana (1833), there are stories of interments by itinerant Indians as early as the 1820s. It is said that a group of Indians on their way to talk with President Millard Fillmore in the 1850s buried a comrade in the cemetery and then cut a path through the brush from his grave to the Boneyard Creek so that his spirit could drink. Immigrants who died of malaria on their way to Peoria were also apparently buried there haphazardly by their relatives. However, the cemetery was never platted into Jots and no record was made of the burials; thus, the number and placement of grave sites remains unknown. Until the opening of Mount Hope Cemetery in 1854, all local burials occurred there or in rural or family cemeteries. Once Mount Hope Cemetery was platted, fewer burials took place at the old cemetery, although many soldiers continued to be buried there-especially those from Col. Busey's regiment. Another factor in the cemetery's demise was the nearby location of the Big Four Railroad (1869), which was seen as an impediment to peaceful repose. In addition, the cemetery apparently had no official standing and was only cared for by the families of those interred. Over the years, maintenance and sanitary conditions became an issue as the cemetery was generally untended. Finally, the City of Urbana prohibited further burials there. In 1902, the city, faced with an unsightly cemetery, directed the removal of the remains to other cemeteries. Relatives and city authorities moved all the identifiable remains to either Mount Hope or other cemeteries. If no relatives could be found, the remains were left in place, with the headstones laid flat over the site. Urbana Street Commissioner, Thomas R. Leal, was given the assignment of relocating the remains. In this position, Leal wrote hundreds of letters to relatives of those buried in the cemetery asking permission to move the remains and personally supervised the reinterrments. The area was finally surveyed in 1903 in expectation of Col. Samuel and Mary Busey's official donation of the property to the City of Urbana, which occurred on April 6, 1903, for use as Urbana's first established public park. 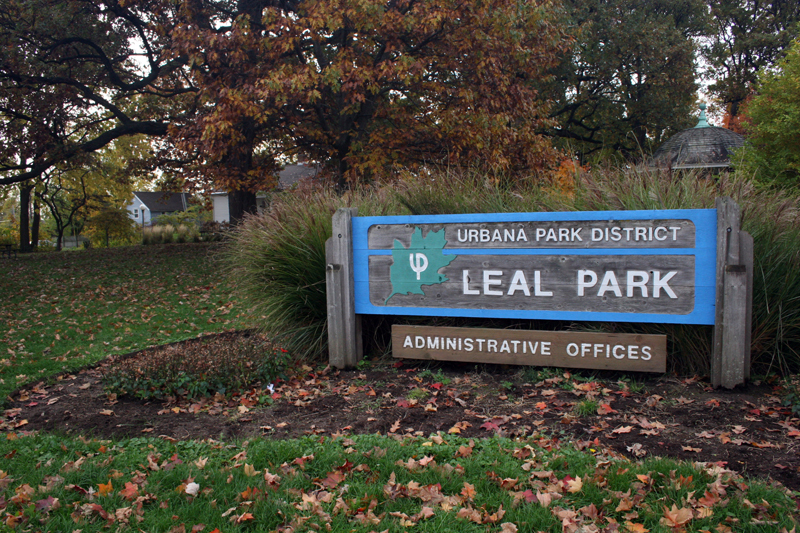 Shortly after the donation, the Urbana City Council voted to name the park in honor of Leal, who had expended considerable time and energy establishing it. When the park district was established in 1907, the city turned Leal Park over to the district as the second park in the system. However, the land was not officially deeded to the district until November 1965. Leal Park's 1.97 acres were laid out in November 1907. By 1915, it had a well-planned system of walks and plantings on its east side and a playground on the west side. A University of Illinois-sponsored planning document declared it to be "the only favorable spot in this part of the town for a playground, and should be devoted to that purpose." Although it had no parking areas, it was reachable by the Lake Shore street car line. 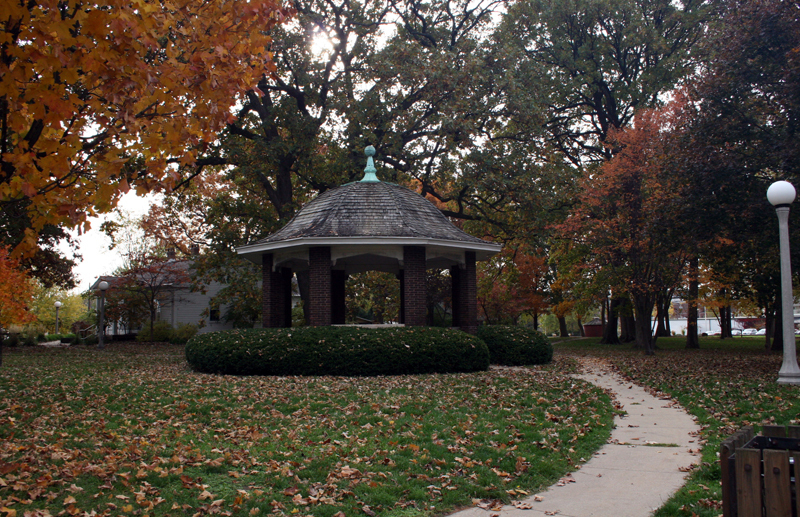 the Champaign County Historical Archives at the Urbana Free Library, and descendants of those originally buried there, convinced the park district to abandon the idea. Leal Park's visibility in the community increased with the relocation of the Greek Revival Cottage to the park in 1976. This circa 1852 dwelling was originally located at 1205 West Springfield Avenue, Urbana (across from University High School). It was scheduled for demolition by the University of Illinois for a parking lot until the Champaign County Historical Museum teamed with the Urbana Park District to move the cottage to Leal Park. The cottage is the oldest documented residence in Urbana and a rare surviving example of the Greek Revival architectural style. This style is associated with the 1820s and 1830s and with the Eastern states. Its late date of construction and placement in East Central Illinois makes it an unusual structure. It is the last of a group of Greek Revival structures known to have existed in the Champaign-Urbana area during the mid-nineteenth century. The building was listed in the National Register of Historic Places in October 1977. The Champaign County Historical Museum received an Illinois Department of Conservation grant in 1980 to stabilize and reconstruct portions of the structure. The scope of work included construction of a full basement; stabilization of the rear addition and structural reinforcement of the first floor; reconstruction of the chimneys; stabilization and re-shingling the roof and eave restoration; installation of guttering and flashing; construction of an interior basement stairway; and installation of water service, plumbing rough-in, sump pump with pit and basic electrical service to the basement. In 1981, however, the museum was unable to financially support any additional restoration, and work on the building stopped. 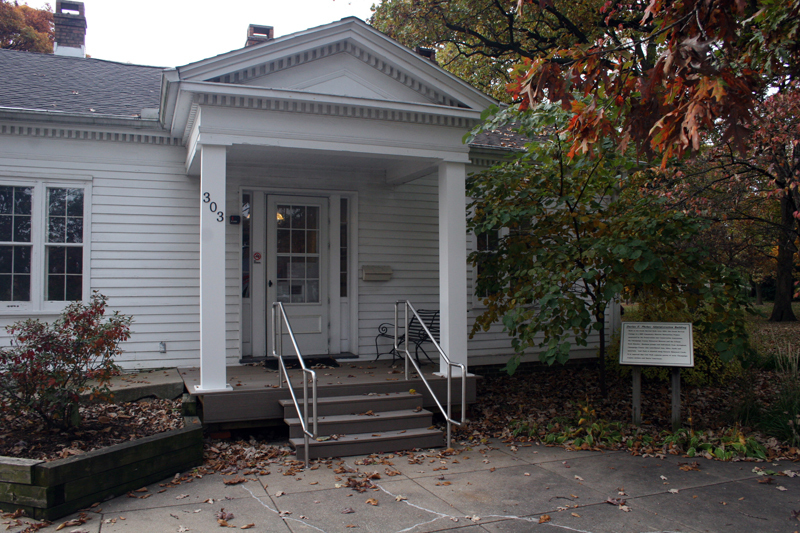 In 1987, the Preservation and Conservation Association of Champaign County assumed responsibility for completing the restoration of the cottage and its adaptive use as office space. With contributions from the community and hundreds of volunteer hours, the project was completed in less than a year. The building's first tenant, the International Society of Arboriculture, moved in January 2, 1988. Thomas Rose Leal was born in Delaware County, New York, in 1829 and was educated at Hobart Seminary in Harpersfield, New York. He followed his uncle, Thomas A. McLaurie, to Champaign County in 1852 and taught in Champaign, Piatt, and Coles county schools. In 1857, he was elected Champaign County Superintendent of Schools, the first educator to hold this position, and he served until retiring in 1873. In this position, Leal organized the first free public education system for the county and the first teachers' institutes. When be started, the county had 43 schoolhouses, but when he retired, there were 214. Leal also helped secure Urbana-Champaign as the site for the Illinois Industrial University (University of Illinois) in part by co-authoring an impressive article on the advantages of having such a university. These efforts lead to his being considered by some as the "Father of Champaign County's Schools." Urbana's Leal School is also named in his honor. Due to illness, Leal retired from his school post at the age of 44 and purchased a farm near the city. He lost the property, however, by using it as security for his friends' business efforts. In the 1880s, he was named as health officer, and his report as sanitary inspector of Urbana was published by the State Board of Health as a model document of its kind. his honor shortly after his death on November ll, 1903. 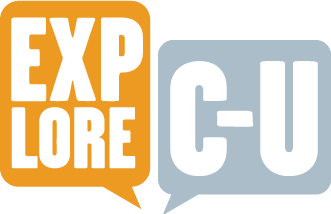 Urbana Park District, “Leal Park,” ExploreCU, accessed April 21, 2019, https://explorecu.org/items/show/156.